The newspapers and online news sources are focusing on the economy, and rightly so. We are in a mess, in the United States, and in Europe, too. I notice that many stories are about things that are not going well–the latest unemployment numbers nearly always bring on a downer. The news from the housing industry is not very good either. But I have begun to notice that among these negatives there are little sprouts of positive news. For example, I have read recently about new housing construction remaining flat, and prices continuing to go down most places, but there are signs of some resurgence in prices, too. Every time there is a small sign of an uptick, there is also caution: don’t get carried away, the gain is very tentative and could stop in an instant. It has caused me to increase my prayer for economic health. It feels to me as if we have little flickers of resurgent economic life and that we need to fan them into larger blazes. Prayer can help with that. Prayer is more helpful than much of the rhetoric that politicians throw around. Much of the time they seem to be more interested in proving that the other guy’s idea is wrong than in fixing anything. Prayer is connecting with God, and trusting that God has some good ideas. 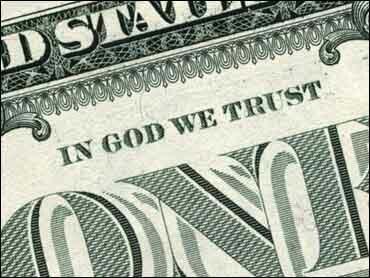 In God We Trust. How about trying that for real, and not just printing it on our money?